When I stopped by the Troy Industries booth last year I was directed to Matt Skutnik for product information. Unfortunately, Matt had experienced a rough night and was not up to the task so we ended up speaking with Joe Gajcevic. As I approached the Troy booth again this year, Matt recognized me and jumped at the chance to tell us what was new with Troy for 2012. Similar to 2011, Matt was in the process of losing his voice but he stuck with it and squeaked his way through the products. The man is a real trooper. Anyway….So this year Troy Industries has made some changes to their Battle Ax stock after much customer concern with the weight. The stock is now about half the mass it used to be which should make many people pretty happy. Troy is also offering a new Delta BattleRail which is a drop-in free-float option or use with the standard front sight post. The newly designed rail does not require removal of the front post or any muzzle devices to be installed. Apparently there have been a lot of requests for a forearm grip option on the Troy rails so they have come up with the Squid Grip which fits securely in the round holes that Troy forearms are known for. The grips will ship in a 6 pack with a price point of just under 20 bucks. 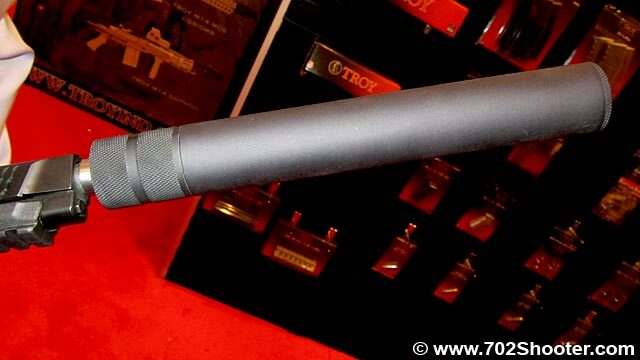 This year TI is also offering 2 new suppressors for the civilian market. The 9mm and .45 versions go for about $600. Now we are talkin’! These are the type of weapons I would like to have.